Reading time 20 minutes. For a quick overview of our beginner kitesurfing lessons please read the beginning and then the texts below the photos. Are you determined to learn kitesurfing? You want to take lessons in this wonderful sport, which will give you an entirely new feeling of life? Or have you tried kitesurfing lessons somewhere else and you did not make it? Then you are right here. 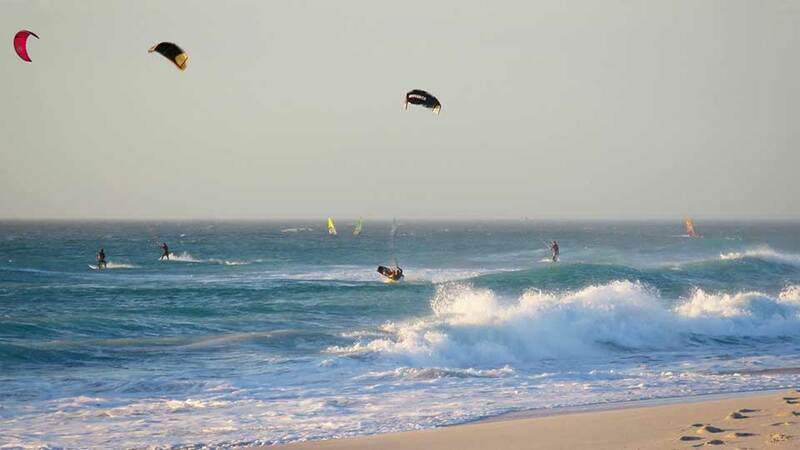 KITEKAHUNAS is the only kitesurfing school in the world, which offers these unique kitesurfing lessons, a beginner course in 4 modules: A, B, C and D. This curriculum we have developed and improved in Cape Town over more than 10 years. We have a 90% success rate to make our students real kitesurfers! The usual success rate for kitesurfing beginners is lower than 1%. 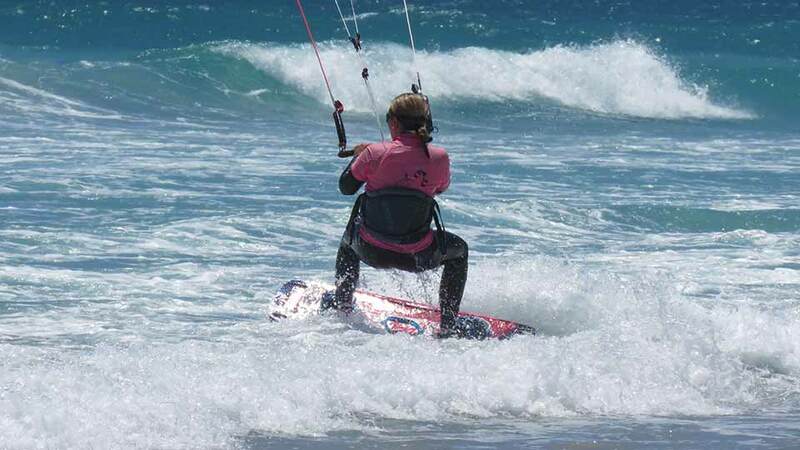 We are a specialised school in advanced kitesurfing lessons. Our school has a special focus on safety. We have expertise for lessons with seniors or children, who need special attention. 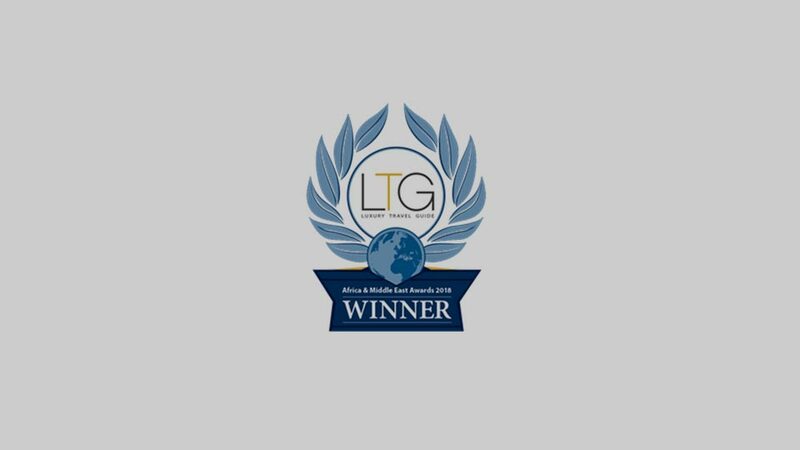 And last but not least, we were the first producer in the world of a Wave Kitesurfing tutorial video course and we are the worldwide leaders in teaching this sport and Wave Kitesurfing. We put quality, safety and success of our students on the forefront! We have a great instructor team with international qualifications. 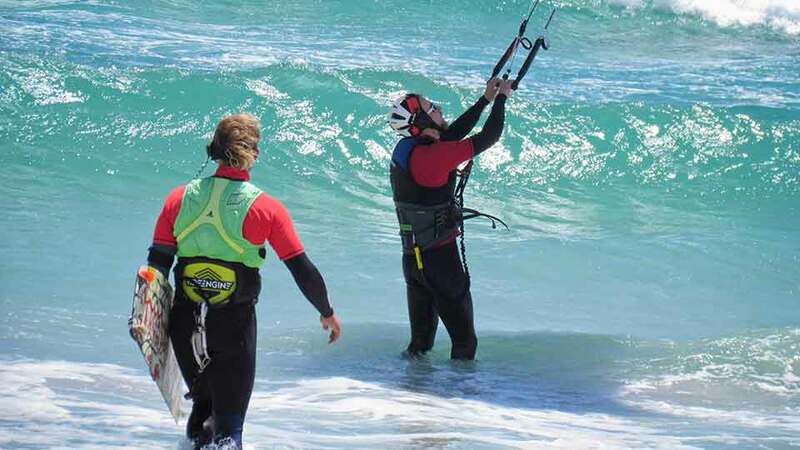 Possibly you have tried kitesurfing lessons or a kitesurfing beginner course somewhere else before, at another kitesurfing school, but then you got stuck, and you never became a kitesurfer? Don’t worry, you share this fate with the many people who have “tried it with kitesurfing lessons”. Kitesurfing schools around the world will tell you that you can learn kitesurfing with 3 days lessons. But then you realise that this is not possible. With our unique kitesurfing lessons and course methodology you will succeed and we will make you a real kitesurfer. Completing the KITEKAHUNAS kitesurfing lessons and beginner course in 4 course modules A to D will make you a real, fully independent kitesurfer. You will be able to kitesurf safely anywhere in the world! Only KITEKAHUNAS offers this unique course curriculum and we have a 90% success rate with over 10 years of experience. We at KITEKAHUNAS have developed this unique KITEKAHUNAS Kitesurfing Beginner Lessons & Course, in four course modules. 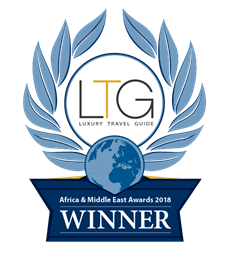 It is only available from us. 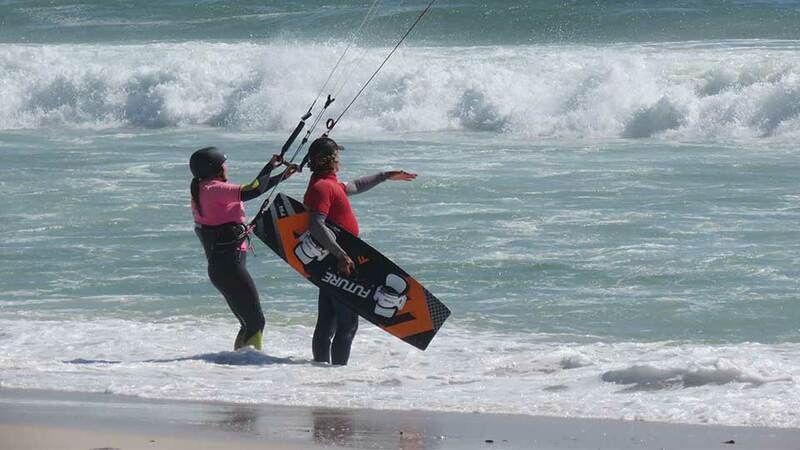 This is the 3 days kitesurfing beginner course. Its content is very similar to the curriculum of organizations like the German VDWS or the British BKSA. Therefore Module A is a very similar course as other kitesurfing schools all over the world offer it, just a bit more elaborate and sophisticated, because we need to get you ready for the next course module. Kitesurfing Course Module A takes 12h lessons within 3 days. You will get on the board, riding your first meters. Only during this stage of your learning career, it is advisable to go to Langebaan lagoon, where you can stand in waist deep water. You need to be able to swim and have at least an average fitness level. 3 wind days with 4 lesson hours per day, so 12 lesson hours in total (be careful, other schools often only do 8 or 10h at the expense of important topics such as ‘safety’). Know the basic theory. Able to launch and land the kite. Perform a self-rescue. Body drag, downwind and upwind. Able to water-start and ride for a few meters, into both directions. 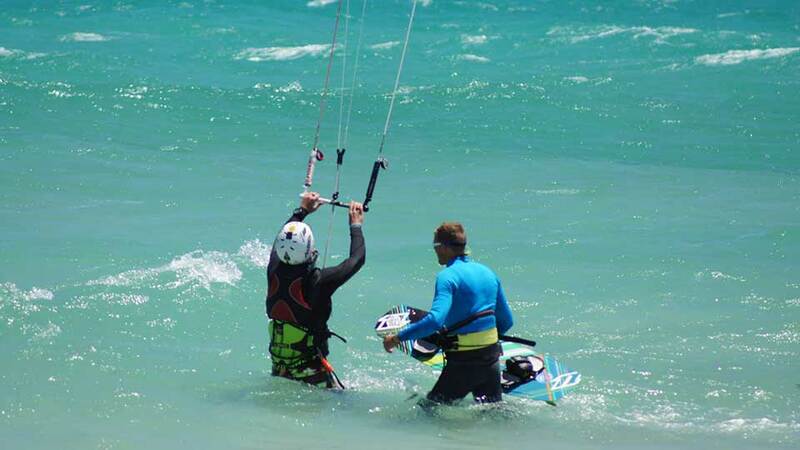 All equipment and materials are included in kitesurfing beginners course module A. Private instruction (1:1) or small two-students group (1:2). Please note: Larger student group sizes, as some other schools do it, do not lead to any good results. We often drive to Langebaan lagoon for course module A, where you can stand in waist deep water, which is of advantage at this stage of your learning. Please note: After course module A Langebaan is not a good place for learning any more. To learn fast thereafter, you need the KITEKAHUNAS Downwind Method as described below at Course Module C. You can do the Downwind Method only with our specifically qualified instructors and in a few places in the world, and Cape Town is one of these. 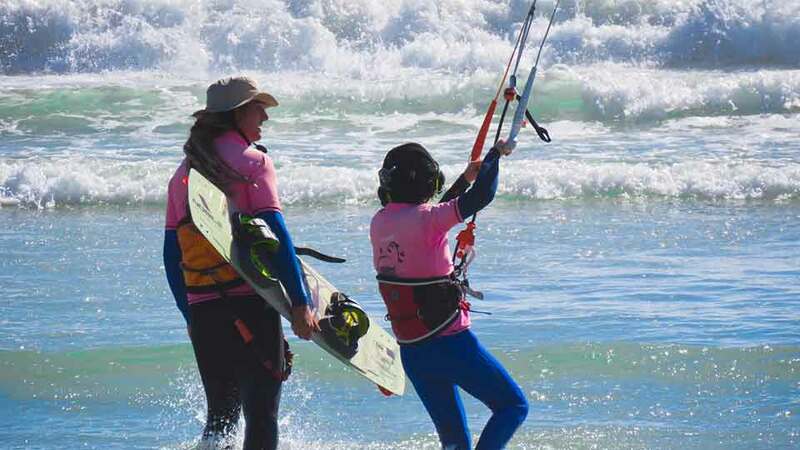 If you have already completed such a kitesurfing beginners course somewhere else, and if you can waterstart and ride a few meters into both directions, you only need 1 refresher day for Course Module A (A3) and then you can continue with Course Module B. 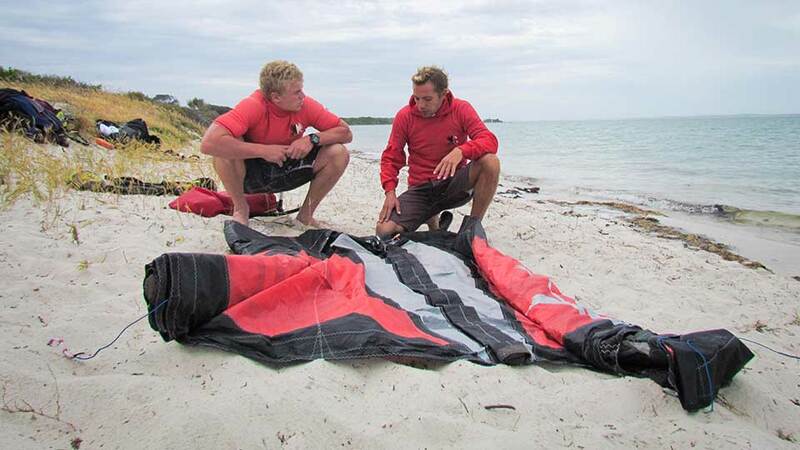 After your Course Module A, you will need the KITEKAHUNAS downwind method to progress further. 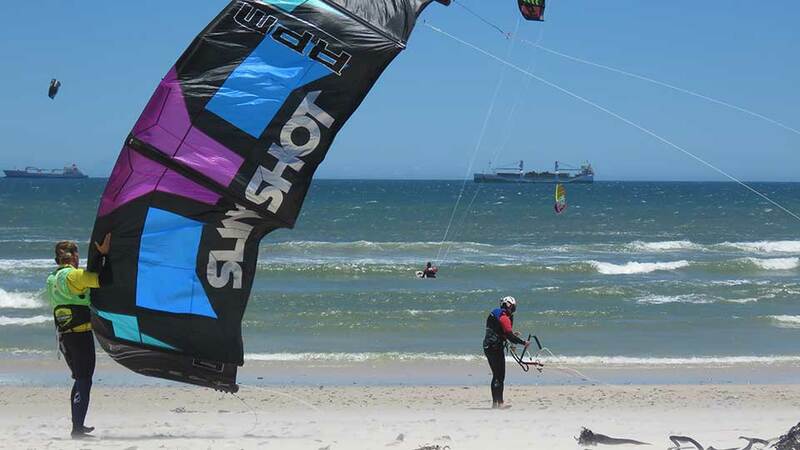 If you stay in shallow waters, for instance in Langebaan, you would ride away from your instructor, downwind, and you would spend most of your valuable lessons time walking back upwind, exhausting yourself. This would make your progress very slow. With the KITEKAHUNAS downwind method you progress much faster, and you will use your lessons time much wiser. For the downwind method you will need to go on the ocean. Course Module B prepares you for this. KITEKAHUNAS has developed this unique ocean preparation methodology and you cannot get this anywhere else. 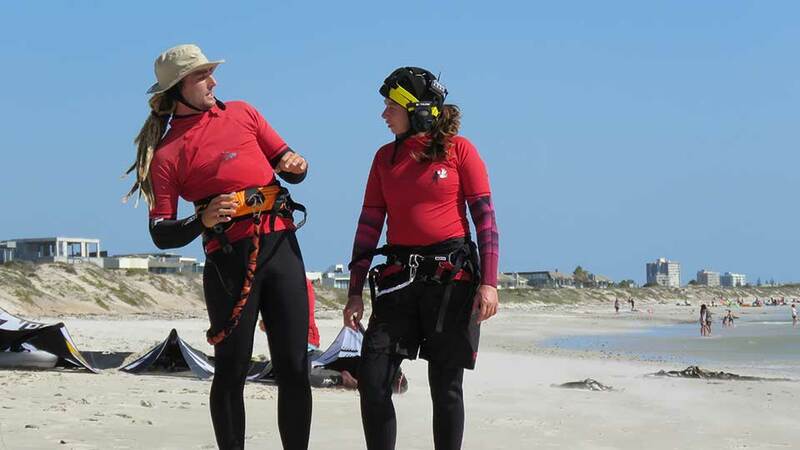 Kitesurfing Course Module B consists of 8h lessons within 2 days. We will prepare you for riding on the ocean, the pre-requisite to really learn our sport. We have developed our proprietary teaching methodology over 10 years and you cannot get this anywhere else. 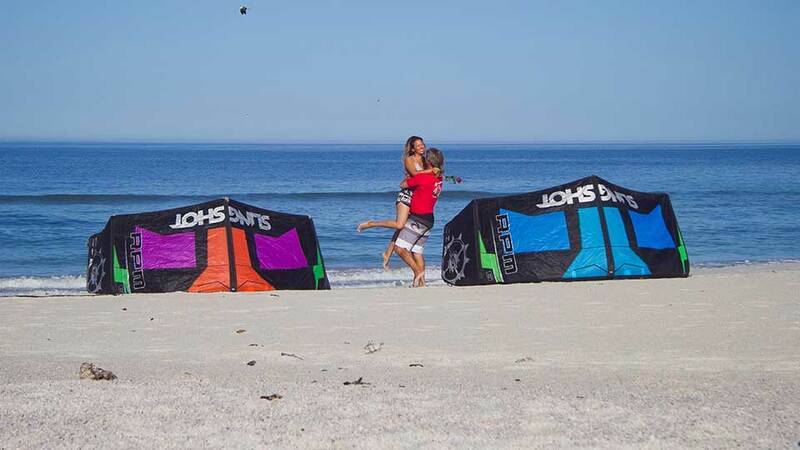 You will also receive our complimentary 2h equipment lesson: The do’s and don’ts when buying kitesurfing equipment. Successful completion of Course Module A. If you have done a beginners course somewhere else, you would need to complete 1 refresher day (day A3) with us. 2 wind days with 4 hours lessons each, and 2 hours of equipment lesson, so 10 hours in total. If you do Course Modules A and B together, please plan for 1 week to find the required 5 wind days. Know how to deal with small waves. How to deal with the shore break. Getting ready for the ocean and the downwind method. All equipment and materials are included in your kitesurfing beginners course module B, or you can elect that we teach you on your own equipment. Private instruction (1:1) or small two-students group (1:2). Radio helmet for safety, instant feedback and fast learning. You learn three times faster. In Course Module C we apply the KITEKAHUNAS downwind method to progress you further. This method is highly effective and you can become a kitesurfer within a week or two, rather than many months or years, or giving up, as unfortunately 99% of all learners do. But not with us, we have a 90% success rate with our students over the last 10 years. This KITEKAHUNAS downwind method requires quite some effort, such as a small bus and a driver, next to your instructor, who is with you on the ocean. It also requires a radio helmet on the water. The KITEKAHUNAS downwind method is explained in our animated comic video How to Learn Kitesurfing – the most effective kitesurfing course (7 minutes). Don’t waste your valuable course time at a kitesurfing spot (i.e. where you stay at one place) and in shallow waters (i.e. where you can stand) at this stage of your kitesurfing learning. If you do this, you will exhaust yourself walking back upwind most of the time, instead of practicing what you actually want to learn at this stage: riding, getting comfortable riding, over many kilometers. 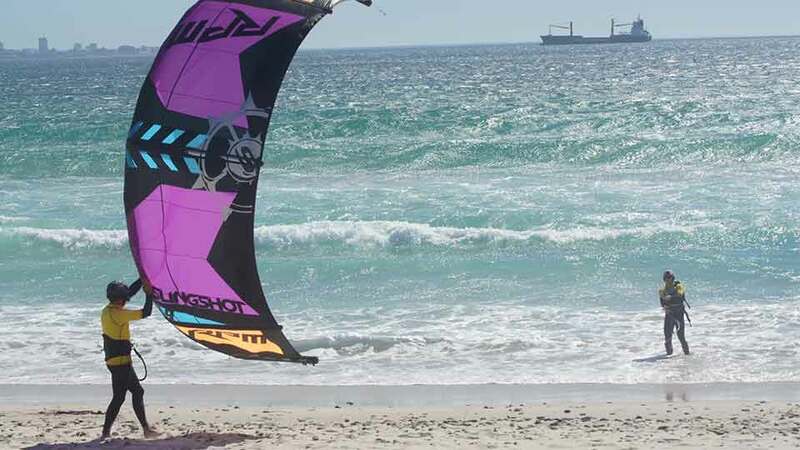 KITEKAHUNAS has developed the unique downwind method on the ocean in Cape Town. You cannot get this anywhere else, professionally. With the KITEKAHUNAS downwind method you learn in 1 day more than you would learn in 10 days when learning spot-based (staying at one place, e.g. in Langebaan, or in El Gouna, or anywhere, where you cannot go on downwinders). It is also much more fun and 90% of our students succeed (as opposed to 99% of the spot-based students, who never become real kitesurfers). On downwinders you will practice in non-crowded areas with almost no other kitesurfers. This is for your safety. Further, you will learn a lot of very important theory, in an area, where the real kitesurfing takes place. You will also get to know critical situations during your course, where you need to know what to do, and how to properly react. During Course Modules C and D you will encounter many of these critical situations, while your instructor is next to you for advice and help. Better than encountering these situations later on your own, not knowing what to do and possibly hurting yourself or damaging your equipment. Keep in mind: Kitesurfing is a potentially hazardous sport. Therefore, learn with the best. 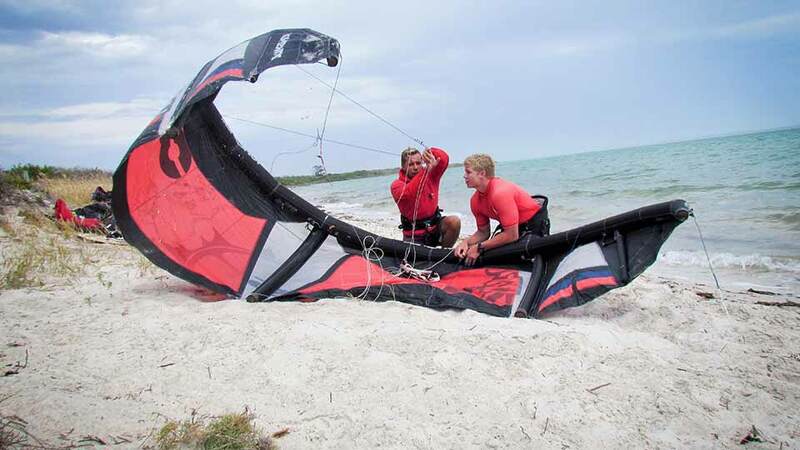 The KITEKAHUNAS downwind method on the ocean is simply a must, if you seriously want to learn kitesurfing. which you can usually complete within 1 week. Learn riding comfortably, many kilometers, and practice safely in less crowded areas! We teach with the KITEKAHUNAS Downwind Method, which is explained in our animated comic video How to Learn Kitesurfing – the most effective kitesurfing course (7 minutes). Successful completion of Course Module B. 5 wind days with 3-5 hours lessons per day. Please plan for 1 week to find the required 5 wind days. Advanced theory and safety. Learn riding comfortably on the ocean. Ride many kilometers. Learn basic transitions (change of direction). You either purchase your own equipment. KITEKAHUNAS offers equipment at preferential prices (to our students). Tourists also save 15% VAT (which you will get refunded at the airport). Let the savings pay for your kitesurfing course! Radio helmets for safety, instant feedback and fast learning. You learn three times faster. In there we explain the KITEKAHUNAS Downwind Method. This is the most effective method for your kitesurfing lessons, with which YOU will succeed (7 minutes). In Course Module D we continue to apply the KITEKAHUNAS downwind method to progress you further. 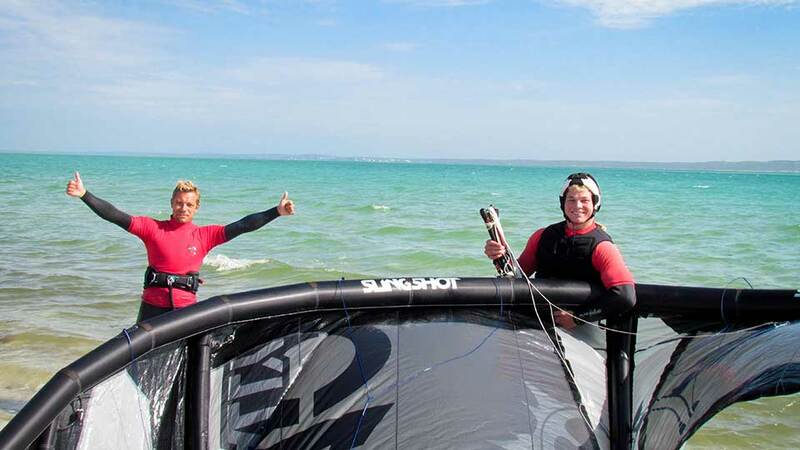 After this Course Module you will be a real, fully independent kitesurfer! You will be able to safely kitesurf anywhere in the world. The key to be fully independent is that you learn riding upwind. 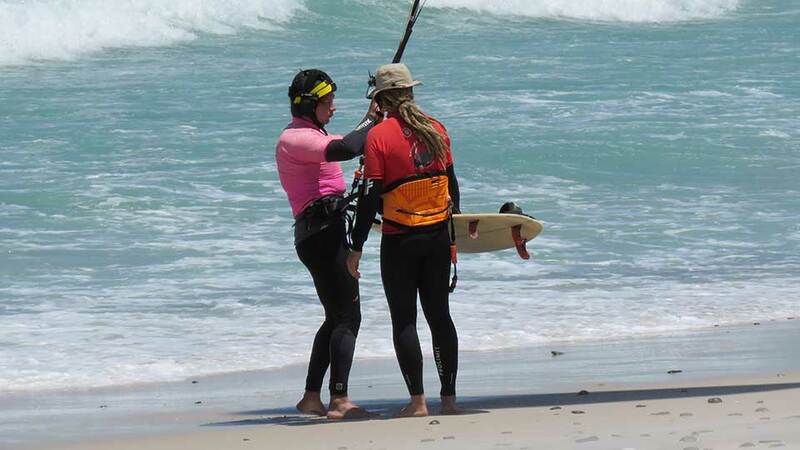 This is the most difficult part when learning kitesurfing, and this is the stage, where most learners give up. Not so, when you learn with KITEKAHUNAS unique teaching methodology and the KITEKAHUNAS Kitesurfing beginners lessons and course in 4 modules. Almost all of our hundreds of beginner students are real kitesurfers today! Being able to ride upwind means that you can fully navigate. 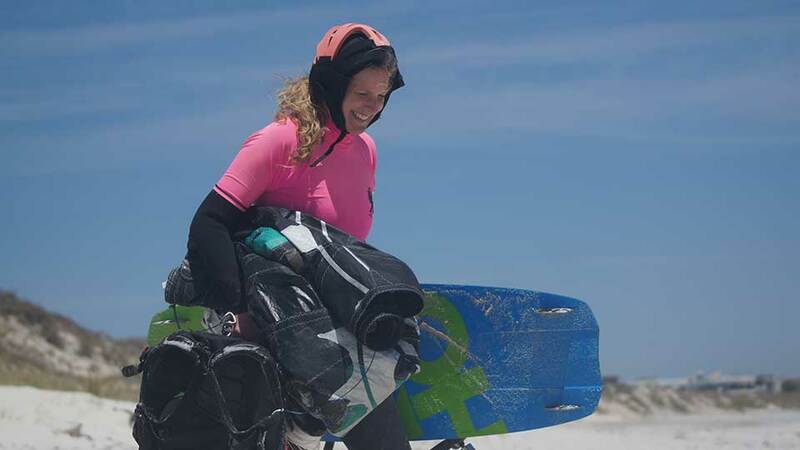 You can enter into the water, ride and practice, and then you determine where you get back to the shore (and not mother nature, which drifts you downwind, out of control). Once you can ride upwind, kitesurfing and progressing further will be pure fun (because you don’t have to walk upwind any more). With us you can learn safely with the KITEKAHUNAS downwind method, you will be able to deal with small waves, you will learn lots of theory and safety, and you can purchase kitesurfing equipment at preferential prices (you save 25-40% as compared to Europe or the Americas). On downwinders you will practice in non-crowded areas with almost no other kitesurfers, for your safety. 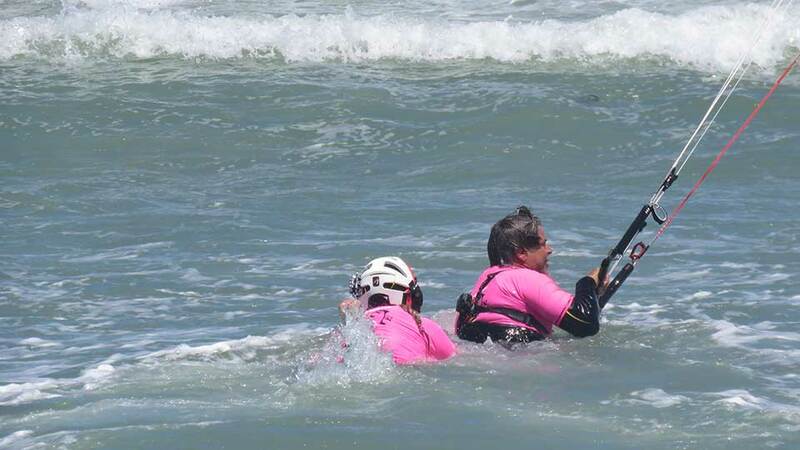 After Course Module D you will be a real kitesurfer and people will admire you. You will come home with your own equipment to exercise your new sport. If you are very talented, you will even learn your first jumps towards the end of Course Module D.
These kitesurfing lessons you can usually complete within 1 week. 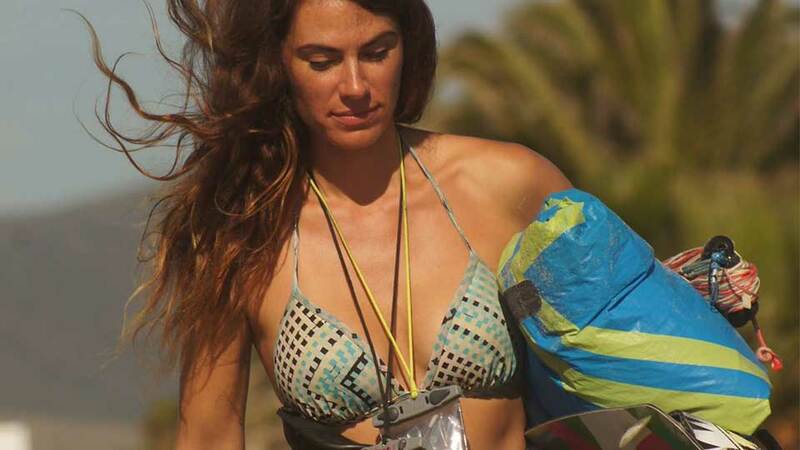 Learn riding upwind and become a fully independent kitesurfer. Enjoy your new life, which kitesurfing will give you! Successful completion of Course Module C.
5 wind days with 3-5 hours kitesurfing lessons per day. Please plan for 1 week to find the required 5 wind days. Advanced theory and safety. Learn riding upwind. Ride many kilometers. Practice basic transitions (change of direction). Become independent. Possibly (for the more talented) start learning to jump. You either purchase your own equipment. KITEKAHUNAS offers equipment at preferential prices (only to our students). Tourists also save 15% VAT (which you will get refunded at the airport). Let the savings pay for your kitesurfing course! 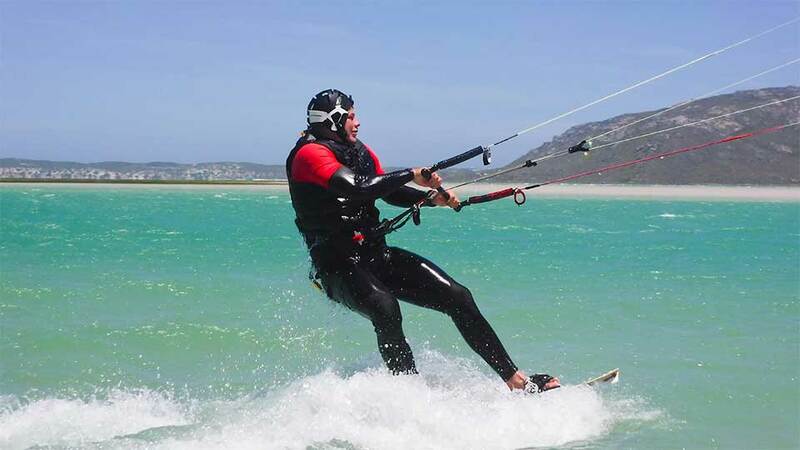 This modular kitesurfing beginner course is unique and only available from KITEKAHUNAS in Cape Town. We have developed this teaching methodology over more than 10 years, and we specifically train and supervise our instructors to be able to apply it for you. 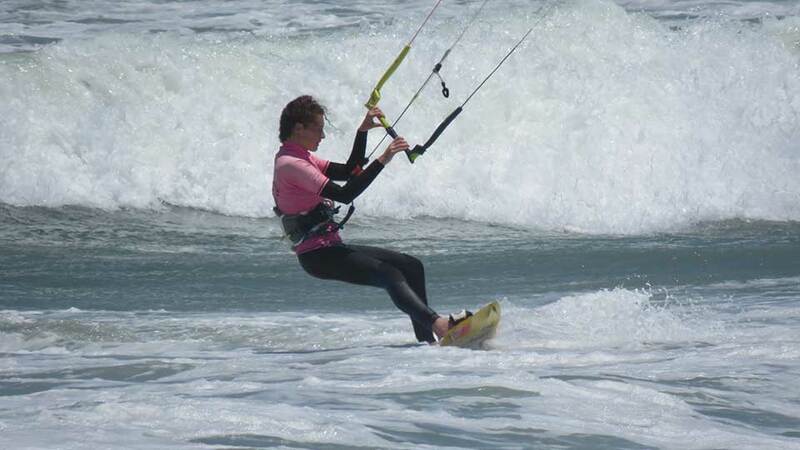 All prices are for private kitesurfing lessons, for best safety and fast learning (1:1). Group lessons for 2-students groups (1:2) are possible. Both participants get 20% discount. We can also organize accommodation for you, and we have our own holiday kitesurfing apartments, very beautiful, directly on the beach. If you have done a beginners course somewhere else until waterstart and short riding into both directions, you only need day A3 before you can continue with Course Module B.